As noted in our previous commentary, Supply Chain Matters has featured a number of blog commentaries highlighting the various supply chain management accomplishments and challenges related to the commercial aircraft industry. Current unprecedented, multi-year customer order backlogs for new aircraft are having an effect on the entire aerospace industry supply chain ecosystem. The need for commercial aircraft manufacturers to ramp-up their supply chains to support unprecedented levels of production volumes continue to provide unique challenges for this industry. This week, this Editor attended the Council of Supply Chain Management Professionals (CSCMP) annual conference. Besides having the opportunity to moderate a highly informative and industry focused panel discussion co-sponsored by The Washington Post and Ryder (more background and commentary forthcoming in a future posting), we did manage to take in some rather noteworthy educational sessions. One session that stood out for this author was: Digital Control Room for Supply Chain Management, which described the development and ongoing operation of Airbus’s Supply Chain Control Room. Having featured so many prior commentaries related to Airbus’s ongoing product development, manufacturing and supply chain activities, this presentation, delivered by James Snow, Director of Supplier Management and HO Supplier Development, provided us one of the key tenets that helps Airbus to successfully scale-up its manufacturing and supply chain activities. Snow described the Airbus Digital Control Room as the heartbeat of the Airbus supply chain, providing a singular information and resolution control hub to manage any issues occurring across the multitude of multi-tier suppliers that support Airbus’s production volumes. 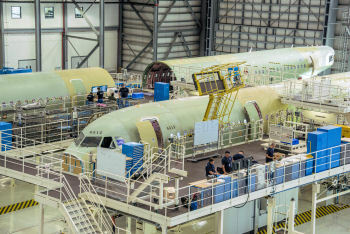 Airbus currently delivers a new aircraft, on average, every 7 hours among 11 owned production facilities and 8 final assembly lines, and the need for a singular control mechanism to coordinate, resolve and communicate status information across a truly global based supply chain is clearly evident. The effort kicked into high gear when Airbus began program preparations for the new A350 aircraft introduction and ramp-up. Last year Airbus completed delivery of 14 A350’s, while 29 are planned for completion this year. Airbus has plans to eventually ramp A350 production to 13 per month. The control center is described as a combination supplier mapping and a singular control mechanism where multi-functional teams come together to ensure that Airbus’s supplier and other management teams are focused on the same set of issues. Its evolution was a visual paper “war room” concept which many of our production management readers can well relate to. In 2014, Airbus’s top 80 suppliers were monitored for performance and capacity risks. During 2015-2016, the effort was expanded to include the entire supply chain, along with the need to enable and control activities in a digitally supported environment. Today, the supply chain control center serves as the overall focal point of the supply and production demand network, a singular control point for supplier issues managements, and a mechanism available for Airbus senior management to monitor, resource and report on current production performance. From our lens, one of the more fascinating learning’s derived from Airbus’s efforts in this area was the application of technology. The overall technology scope was described as not one of a big-bang program deployment of the most sophisticated technology but rather one of continuous, agile rapid development utilizing standardized software applications. The process calls for every Airbus supplier to have a common identifier supported by the capturing of rapid scan health checks for each supplier. Suppliers tracked are multi-tiered, extending to the level of tier four suppliers, as one cited example, including bathroom counter tops. These rapid scans include overall capacity status, known supplier issues as well as issues that may be caused by Airbus itself as a customer. Eight core supplier skills are monitored on a continuous basis. Any supplier issues are managed with clear action plans that are recorded, monitored and made visible. More importantly, a process is enforced where the supply chain control center serves as the single source for Airbus management teams to coordinate and report supplier capabilities and maturity, industrial capacity and any supplier risks. Color coding is utilized to rank various supplier and/or Airbus issues and to focus Airbus’s supplier management teams on the most critical or rear-term issues needing resolution. Supplier management teams are described as now spending more of their time directly at supplier sites working on these key issues as opposed to internal management reporting and update meetings. Articulated major benefits are teams focused on real problems and assisting suppliers with resolving their challenges. Further described is global transparency and trust among internal and external teams with early warning to issues that can impact Airbus. Once more, every level of management has identified levels of responsibility related to certain supplier issues. An unexpected benefit was described as this tool serving as an archive of prior product design or component engineering issues and as a foundational data store to be able to more reliably predict degradation of key performance indicators. That will likely serve as a future basis for mining supply chain intelligence and more predictive analytics capabilities than can better anticipate supplier challenges down the road. The more we heard, the more this supply chain control center sounded as a mechanism to support and serve the executive level sales and operations planning process that exists among many manufacturers. Moving forward, Airbus has plans to enhance supply chain control center functions with mobile-based user enhancements along with making this tool available to other functions such as manufacturing engineering, product development, contracts management and customer support. Key learning and success factors experienced by Airbus in the use of this tool is that transparency builds trust. Initially, the fear of yet another reporting mechanism hindered initial broad deployment efforts but as the control center began to remove duplicate reporting, acceptance was gained. The Airbus supplier management team placed the development focus on process and people first, with technology serving as the adapting or best enabling support tool. Strong management endorsement and use of the tool was important as well. Another key learning articulated was that low cost and low tech approaches can work when coupled with continuous, incremental phased development. Airbus’s Supply Chain Digital Control Room development was sponsored by CSCMP as one of six selected finalists in the organization’s 2016 Supply Chain Innovations of the Year recognition award. Judging from what we observed, Airbus has implemented unique innovation in the management and control of supply-chain wide visibility and to supplier management ramp-up and issue resolution needs without the need for a elongated big-bang technology-driven deployment. We thank Airbus for allowing this capability to be shared at this year’s CSCMP event.